It is an honor and privilege to serve as the 2018 President of the Durant Area Chamber of Commerce. The strength of our Chamber has sustained for 108 years. We have faced many obstacles but due to the strong leadership of our community and the foresight of our founding members, we have progressed and continue to move forward. Upon the advice of our membership committee, the Board of Directors voted unanimously for an increase of the membership investment effective July 1, 2018. We have attached a copy of the new investment schedule for your review. This will allow our Chamber to move forward and progress as we continue to serve our membership. With cost of business increasing on an annual basis, we feel it is necessary for this slight increase in our investment schedule. Our investment schedule has remained the same for the past 15 years, but the cost of doing business has not. 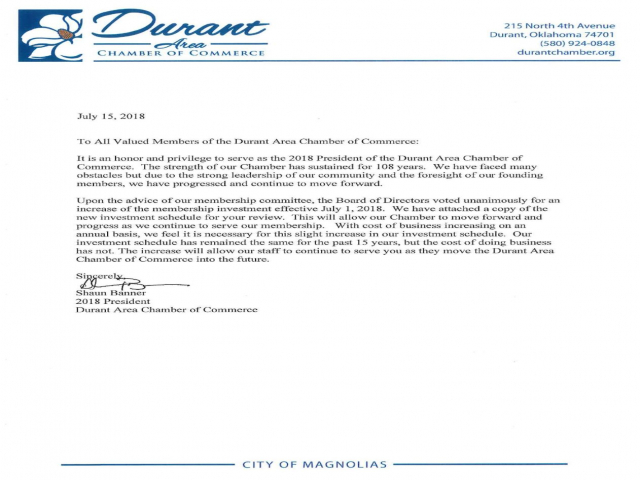 The increase will allow our staff to continue to serve you as they move the Durant Area Chamber of Commerce into the future.